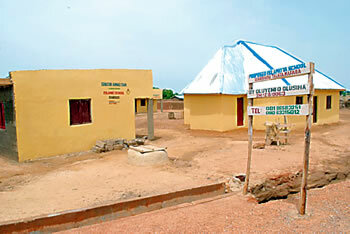 Corper honoured in Zamfara for building school - Gets chieftaincy title, political rights - Corpr! Here’s the story of an Oyo State citizen who, reluctantly, went to Zamfara State for the mandatory one-year National Youth Service Corps (NYSC) scheme, but is now hesitant about returning home. FRESH graduates dread being posted to the northern part of Nigeria for the mandatory one-year National Youth Service Corps (NYSC). The scaling up of insurgency in the area and its concomitant loss of lives, as a result of which the NYSC has offered unconditional redeployment for thousands of serving corps members, has confirmed the fears being expressed by intending corpers. However, it is not all bad news for corps members posted to the North. Some have made great connections that have taken them to the higher rungs of the social ladder. Some have been engaged in inter-ethnic marriages that have blossomed, while others have made the best use of the opportunities in the northern part of the country. To this class that has made the best of their time in the North belongs Mr Ololade Olusina from Ogbomosho North Local Government Area of Oyo State. Born in 1984 and educated at the Ladoke Akintola University of Technology (LAUTECH) with a degree in Animal Production and Health in 2011, Olusina was posted to serve in Zamfara State in 2012 in Batch B. He told Saturday Tribune that when he received his call-up letter and saw that his destination was Zamfara, his heart missed a beat. “My heart was in my mouth when I read on the call-up letter that I would be going to Zamfara State. I was afraid because of the stories of bombing of corpers by the Boko Haram sect, which makes the North insecure. Instantly, I made up my mind I would seek redeployment as soon as I got to the orientation camp,” he said. The hope of a successful transfer fired him to travel to Chafe, venue of Zamfara State NYSC Orientation Camp, a day before the camp was opened to corpers. As Olusina told Saturday Tribune, unlike the experience of his colleagues who also got to their camps a day to the opening of the venues, the state NYSC officials gave them a warm welcome and accommodated them till the following day when the camp was opened officially. This, however, did not change his premeditated view about the state and the North, and so he stuck to the plan of seeking redeployment. With the three-week orientation over, he was handed a posting to a village called Garbadu in Talata Mafara Local Government Area of the state, specifically Rufai Farms, a privately-owned farm, where he was asked to render his service to his fatherland. About two months after, still keen on seeking redeployment to his roots in Oyo State, he got summoned from the office of the state coordinator, where he was counseled against his decision to seek a transfer. That did the magic. He began to rethink and then resolved to look inwards for areas he could contribute his quota to the development of the state and the country in line with the letters and spirit of the establishment of the NYSC programme decades ago. It was at this point that he discovered a need in the village: school-age children with no educational facility to train them. All the children did, day after day, according to Olusina, was play and idle away in groups. From that moment, he decided to lend a hand to help them secure a future. He started by writing appeal letters to well-meaning citizens of the state to donate towards the building of a school and other facilities that would make life worth living for the children and the villagers. This was his initiative of community development service, which is one of the pillars of the NYSC scheme. “Some of the people in the village initially doubted my sincerity about the project. They considered building a school a big task for a corper like me whose allowance from the Federal Government I could barely survive on. They said I was not the first corper to be posted there, and so wondered what difference I could make. But they are very accommodating people. “Those who had doubted my sincerity of purpose and said I wanted to raise the money and run away began to sing a different tune when a large parcel of land was secured and cleared for the project. Before I realised it, the villagers were supplying free labour for the project, convinced that I meant well for their community,” he said. Olusina was able to raise N12.3 million from eminent citizens of the state and, together with a little from his monthly allowance, he was able to construct two blocks of six classrooms, a staff room, two toilets and a big mosque in Garbadu village. On completion, he met with the elders and leaders in the village at the palace of the village head, Alhaji Dahiru Maiyara, where it was decided that the school be christened Senator Ahmed Sanni Yerima Makura Islamic Centre. The facilities were inaugurated by the Speaker of the state, Right Honourable Sanusi Garba Kiriji, at a ceremony about two months ago, with other top personalities like the Talata Mafar Local Government chairman, Alhaji Dairu Maraya; the State Coordinator of the NYSC, Mrs Ruth Bukka; Garbadu Village Head, Alhaji Murtala Mohammed, and other NYSC officials, corps members and a lot of people from the benefitting community in attendance. The significance of Olusina’s labour of love was not lost on eminent people of the state. He got a chieftaincy title Jarman Garbadu, one of the highest chieftaincy titles in the district (meaning a wealthy and respected person) from the village head. With this title, he will be sitting in the row with the eminent in the district and be part of decision-making echelon in the village. In addition, he got over 10 hectares of land and another portion to build his house in the village, apart from the citizenship of the village, which qualifies him to contest for any elective position in the area, as stated in the letter given him by the district head. In a letter to the NYSC office and in appreciation of the rare feat of Olusina, Senator Yerima, who represents Zamafara West Senatorial District under which the village falls, said “this youth corper has demonstrated a sense of unity and purpose, especially at this point when our nation is in dire need of people like him. Despite (the fact that) Mr Oluyemi is from the South-Western part of Nigeria, yet he extended his gesture to a less privileged society. In recognition of the feat and to send a message to intending and serving corps members that their labour of love in community development service will not go unrewarded, the NYSC gave him the best corps member award. On the indigeneship and political right conferred on him, Olusina, who has got more than a nodding acquaintance in Hausa language, told Saturday Tribune he might consider contesting for political office in the community to further contribute his quota to the development of the village. He said, “There are still other challenges confronting the community that I can help them address by contesting and winning election. For instance, the youths of the area need to be developed and I will do just that if elected. I wish to do more for the village before I will come back to Oyo State to contribute to the development of the Pace-setter state too in any capacity. Already, my school has contacted me and congratulated me for the achievement and emissaries from former governor Adebayo Alao-Akala have also got in touch with me,” he said. He thanked those who contributed to making the projects realistic and prayed to God to replenish their purses for helping lift the village and securing a future for its children. Olusina charged fellow youth corps members to always know that their being posted to a particular place was not an accident but a charge for them to look for what they can do to better the lot of their host communities rather than contemplating redeployment. He also commended the hospitality of the people of the village. Olusina went to Zamfara with a heavy heart but after writing his name in gold in the state, he has found a second home of sort in a place he had thought would be a pariah community.